When you write a blog about your Glorious Pursuit of Delicious Burgers, you get a lot of suggestions from people on where to eat them. In fact, that’s how I found out about of lot of the great Burgers out there and love it when somebody turns me onto something new. Got one to suggest now? The Burger hot lines are always open at beeftouchdown@burgerconquest.com. 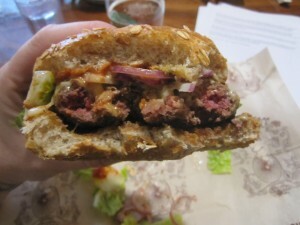 One such place that’s been put on my burger radar screen by several people is Bareburger. 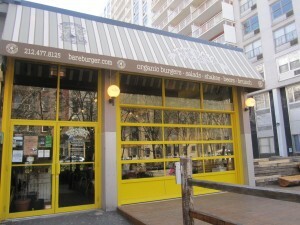 Ever since they opened their first location in Queens, Burger friends have been asking me if I had tried them yet. 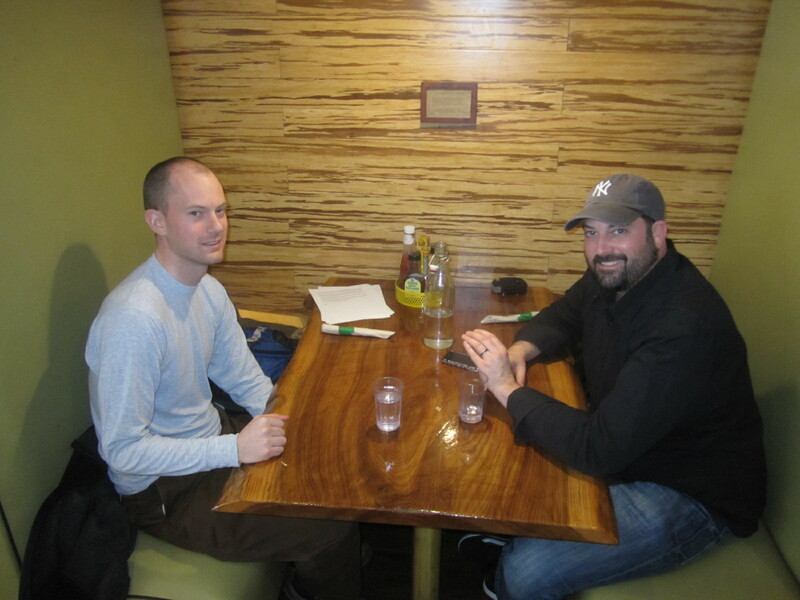 So when my buddy Will from Beer Menus suggested we catch up over a Burger, I knew it was finally time. Beer Menus is a fantastic website that started out of two brothers’ love of craft beer. The concept is simple, if you’re looking to find a waterhole that’s serving a beer you’ve been hearing about or missing, you type it into the search field, hit enter and a list of bars and restaurants that are serving the beer appear with prices and sizes. For bars like the one I own, Idle Hands, it’s an amazing way to let the craft beer community know what’s currently on our 50+ list of rotating beers. Their open API allows bars to pull their own beer menu into the bar’s website to make it extra easy. Beer Menus also works with bars and restaurants to offer out special deals that help the craft beer world to promote to the unique audience of craft beer enthusiasts who, like me, use Beer Menus regularly. We work with them to sell tickets to our weekly Learning To Beer class at Idle Hands. For only $35, craft beer fans enjoy a 2-hour event with tastings of 3-5 different beers from a brewery representative or a beer expert pouring and teaching about the brand & style. The class also comes with 2 full drafts of beer and appetizers. It’s a great event and we love working with Will his brother Eric at Beer Menus to help spread the word of quality craft beers. If you appreciate the finer qualities of craft beers, chances you also are a fan of quality food and the restaurants that serve it. If so, then it’s time you knew about Bareburger. With 2 locations now open and a 3rd in the works, they’re serving up tasty Burgers, all made from fresh organic ingredients sourced from local farmers. Start off your sandwich with your choice of Beef, Turkey, Lamb, Veggie, Portabella Mushroom, Elk, Bison, Ostrich or Grilled Chicken with our without Cajun Spices. From there you have a selection of buns and toppings so big that there are 250 different ways to build your Bareburger. Sound to daunting to create a Hamburger, not too worry, they offer a suggested menu of Burgers, Sliders, Wraps, Salads, Breakfast items and even “Cubby” Meals for the Kids. The concept also extends to Bareburger’s drinks menu with a selection of wines, craft beers and sodas to wash it all down. I’d love to tell you which beers they have but unfortunately they aren’t listed on Beer Menus…yet. Will – do your magic. 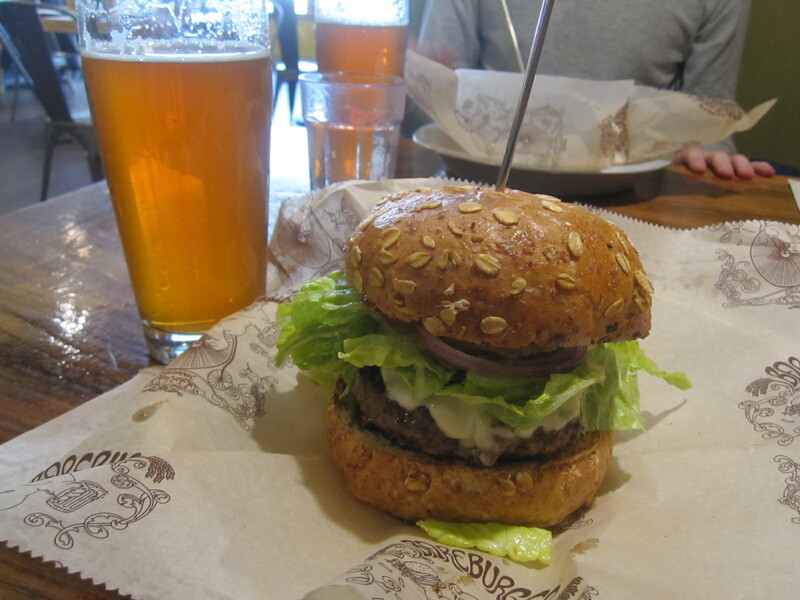 Burger and Beer fans need to know where they can get a fantastic Wolaver’s Organic IPA while dining at Bareburger. I’m a HUGE fan of wild game, eating it that is, not hunting it and when given the chance to do so, I almost always do. 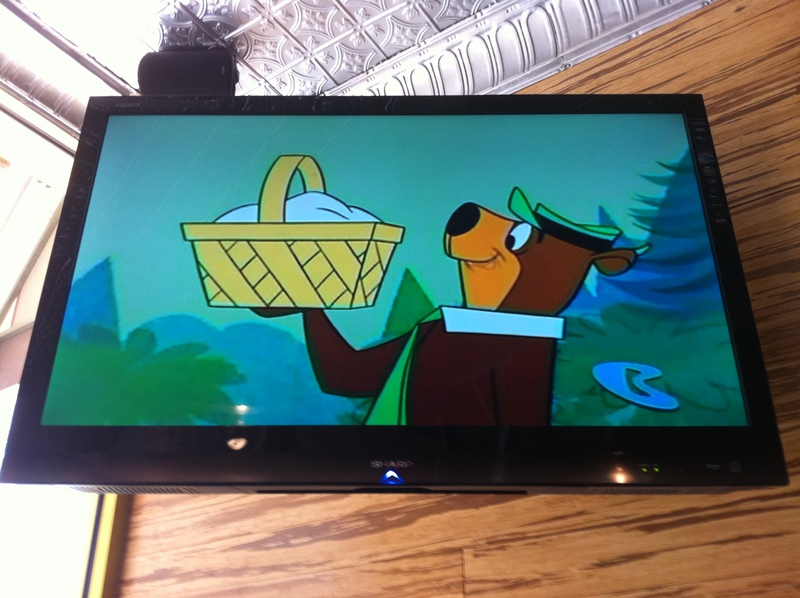 Without even perusing the toppings menu, it was a guarantee from the onset that I would be ordering the Elk. The idea became written in stone when I saw that the Jalapeno Express, with Pepperjack, Romaine Lettuce, Red Raw Onion, Jalapeno Relish, Horseradish Mayo and Chipotle Ketchup, comes recommended for Elk. Pop all that into my choice of a Multi-Grain Roll and you got a Burger worth talking, errr, blogging about!! The sandwich was not short on taste, in fact, there was so much going on that each and every bite had it’s own unique taste profile. For a guy that eats as many Burgers as I do, it was great to have one made from Elk which has a slightly sweeter taste than beef. Surrounded by all the savory and spicy toppings, this is one interesting and unique Burger. On the way out, I noticed they had Yogi Bear playing on the TV and if it wasn’t intentional, it should be. Bareburger is better than the average Bearger, but that’s kind of the point, isn’t it? 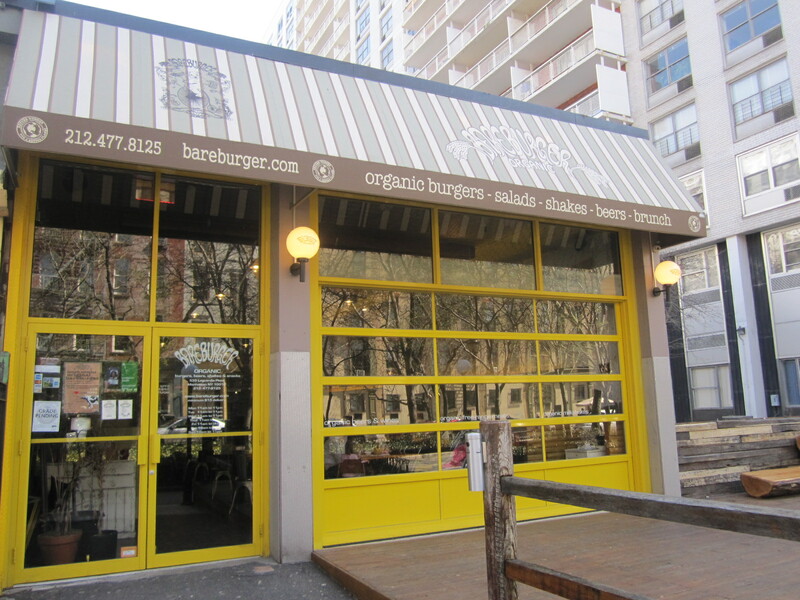 This entry was posted in Beer, Burgers, Gourmet Burgers, Hamburgers, New York and tagged bareburger, beer, beer menus, beermenus, burger, cheese, ciancio, conquest, craft beer, elk, french, fries, great, hamburger, micro, new york, ny, nyc, organic, rev, review, the, wild game, will, wolavers, Wolavers organic ipa. Bookmark the permalink.